Philip Glass, who is recognised as one of the leading proponents of minimalism in the world today, has written over twenty-five operas, a total achieved by hardly any composer since the days of Rossini, Donizetti and Verdi. Three of these form the ‘portrait trilogy’, which focuses on pivotal figures in the fields of science, politics and religion respectively. Einstein on the Beach premiered in 1976, Satyagraha (about Mahatma Gandhi) followed in 1980, and then the triptych was completed four years later with Akhnaten. This final opera appeared at English National Opera in 1985 and 1987, but was not seen again at the Coliseum for twenty-nine years until a new production from Improbable director Phelim McDermott was introduced in 2016. The opera explores the reign of Pharaoh Amenhotep IV who renamed himself Akhnaten as he changed Egypt’s entire religion to worship the sun god, Aten. Although the story is told chronologically, the piece is not predominantly plot driven, with the majority of scenes meditating on an event that occurred during Akhnaten’s reign, whether that be his coronation or his building of the new city of Akhetaten. In keeping with this, and in the same way that Satyagraha is sung in Sanskrit, the majority of sections are presented in Akkadian and Biblical Hebrew, although the Scribe delivers his spoken lines in English while one scene is always intended to be delivered in the language of the audience. The variety of languages used reflects the diversity of the texts, such as the Egyptian Book of the Dead, that are employed, and the programme, which includes full translations and a synopsis, explains everything clearly. The opera is sumptuously presented with Tom Pye’s sets often seeing activity occur simultaneously on three levels. For example, the main action might take place on the ground, while the chorus occupy the first level of scaffolding and jugglers the second. Juggling is, in fact, a key component of the staging with the actions of the Gandini Juggling troupe complementing the minimalist music well. The choice to include this element was inspired by a tomb painting in Egypt’s Beni Hasan cemetery complex, with the actions on stage frequently mirroring those seen in that picture so that we witness some juggling with the arms crossed. The visual images created are stunning, particularly in a scene in which the new city of Akhetaten is shown to be built. Here the complexity of the formations as the jugglers pass balls to each other really gives the impression of something extremely large and complex being constructed. As the scene goes on the balls become bigger before a huge one appears, thus representing the completed city that worships the sun. Dr Robert Bianchi has suggested that the appearance of jugglers in wall paintings may be ‘an analogy between balls and circular mirrors, as round things were used to represent solar objects, birth and death’. On this stage, however, they might also signify atoms, thus contrasting ancient and modern understanding concerning the basis of life. Synergies between the past and present are also highlighted by seeing Kevin Pollard’s costumes cross eras, although almost all of the various headdresses worn bear Egyptian motifs. In fact, the interaction between ancient and modern is a very important component of the opera. Akhnaten is seen as a key figure in the development of monotheism, and the interest we show in him today for his long-term influence on the world means that in a sense his aim to achieve immortality was realised. Conversely, the opera also reveals how short-lived this pharaoh’s dream was. On his death, the old religion was restored (under Tutankhamun) and the city he founded abandoned. In fact, we see a modern day lecturer boring his students by pointing out that everything from it is now either missing, badly damaged or too far out to be worth the trek to see. 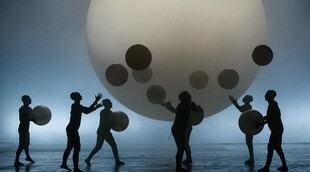 The sadness generated from seeing Akhnaten killed, and his limp, lifeless body cradled, also makes the work feel highly emotional as even the sight and sound of the jugglers’ balls falling to the ground for the final time possesses its own poetry. Although some scenes reveal mass activity, others are deeply personal and it is here that the talents of the cast are really seen. 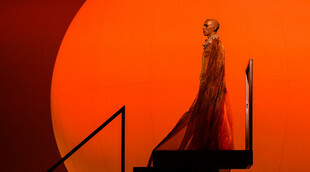 It would seem that Anthony Roth Costanzo was born to play the role of Akhnaten as his countertenor, with its brilliant metallic edge, shows seemingly superhuman levels of precision and endurance, while his persona suggests both god-like perfection and immense vulnerability. Some of the singing involves uttering a series of ‘ahs’ for long periods, and his Act II duet with Rebecca Bottone’s equally accomplished Queen Tye reveals mind-boggling accuracy as the music demands alterations in the length of each. No less captivating is Costanzo’s love duet with Katie Stevenson’s Nefertiti, who in her first lead role for ENO reveals a mezzo-soprano of notable security and depth, as their bond is revealed in the most sensitive way as the trains on their robes intertwine. In the pit, Karen Kamensek’s conducting is outstanding as the orchestra pays exquisite attention to achieving the right emphases, colours and textures at every turn. The result is an evening that is as hypnotic as it is undoubtedly accomplished.